If you're anything like us, you've been wanting to read comic books for years but don't know where to start. In such a world of many dedicated fandoms, choosing your first comic book to read can be daunting - almost like starting a film halfway through. So how do you choose the best comics to start with? We're going to show you, alongside recommending our top beginner comic books. By publisher - who can go wrong with a Marvel or DC? The complexity and popularity of the MCU (Marvel Cinematic Universe) could provide a wealth of fun material to dig into. Or another series that you're interested in would work well too. The main comic publishers available are: DC, Marvel, Star Wars, Image, Dark Horse, Valiant, IDW and Vertigo. 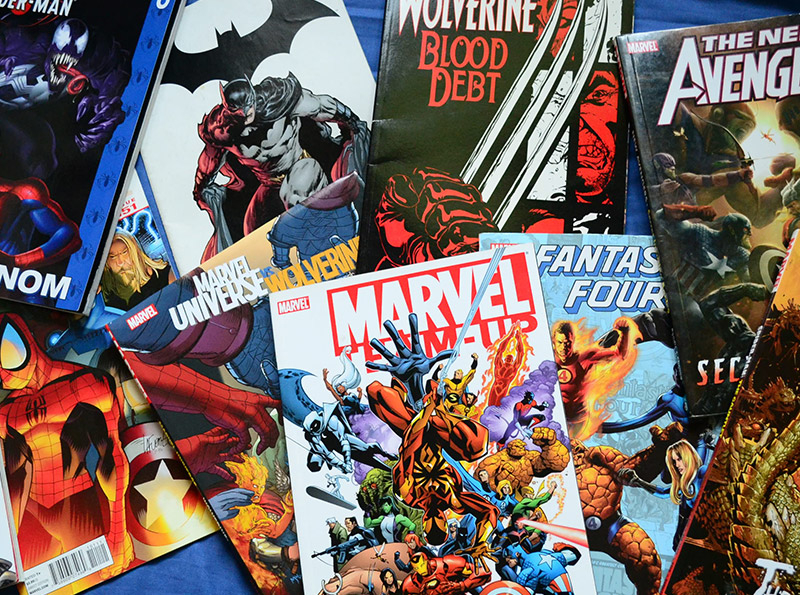 By genre - just like your favourite genres of films or books, you'll quickly develop a favourite genre of comic books after delving in. By best of all time - you've all surely heard of classics like Spiderman, X-Men and Fantastic Four? Classics are pure forms of the best comic books have to offer, so they may be appropriate starting points. They will allow you to begin to tailor your preferences too as you dig deeper, and there are articles from many people outlining their favourite classics that you can refer to - for instance try this list. By artist/artwork - it's not only the writing that makes a comic, but each distinctive art style is what emphasizes a series' character. By choosing a style you like, you can enjoy lots of different comics. Now that you have more of an indication on how to start searching for your first comic book to read, here is OnBuy's recommendations for the top comics to start with. Kamala Khan replaces Carol Danvers in the latest reboot of this classic series. Restoring the nostalgia of 1960's Amazing Spider-Man, Ms. Marvel is a wonderful combination of high school drama and heroism, proving a great first comic to go on your shelf! Published in 1986 and 1987 by DC Comics, Watchmen is known for its fantastic writing and storytelling. Pick up a copy of Watchmen here and follow these ‘Superheroes' trying to overturn their status as outlaws! Winner of the 2013 Hugo award for Best Graphic Story, Saga is an epic space fantasy that follows two soldiers and their newborn baby in a galaxy of hostile wars. It is often described as “Star Wars meets Game of Thrones”, but with a bit more romance and emotion to draw you in further. Undoubtedly one of the top comic books for beginners! Another science-fiction thriller, Black Science will take you on a whirlwind of realities. Follow McKay and his team as they battle enemies throughout various dimensional barriers in a mission to return home again! Comics/stories on characters acquiring special abilities always go down a treat. But the Runaways bring a refreshing change to the cliché superhero image. Doing away with the costumes, these particular teenage superheroes discover that their parents are part of an evil crime organisation and begin to embark upon action-packed adventures from there in these great beginner comic books. Sandman has helped to change the landscape of modern comics. This dark fantasy, published by Vertigo Comics, follows Morpheus the Lord of Dreams through an initial moral crisis where he learns that sometimes change is necessary. From thereon the readers will follow his intense adventures by trying to re-write his sins. This is undoubtedly one of the best comics to start with. You've heard of Batman, right? Well DC's Batgirl is another real contender for a good first comic. An example of influential women in comic book history, Batgirl is an easy read for those slowly lowering themselves into the comic book world but also wanting a dash of feminist empowerment. Those of you who have watched some of the Marvel films will appreciate the brilliance of the character Hawkeye. And his comic books are sure to excite, too, as the original superhero comic releases are responsible for influencing many modern Marvel stories today. This intriguing but eerily scary dark fantasy comic is one of our favourite comics to start reading! The story follows a young girl who tries to avoid the danger of Wytches hiding in the forest and those who have made sacrifices to be granted powers from them. Another classic and crucial character to the Avengers ensemble, The Incredible Hulk is one of the best comics to start with as a beginner. These fantastic comic books showcase both the thrill of his ruthless affairs and the emotional rollercoaster of his moral predicament - not to mention collaborations with other Avengers throughout to maintain your excitement.